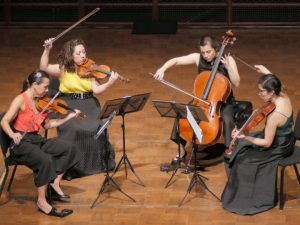 After two days of semifinals and finals concerts at the University of Michigan, the Aizuri Quartet has won the $100,000 M-Prize for the third annual chamber arts competition hosted by the U-M School of Music, Theatre & Dance. The announcement was made Sunday night at Hill Auditorium after the grand prize gala competition, which also featured senior open division winner invoke and senior winds division winner The Moanin’ Frogs. The quartet-which includes members Ariana Kim (violin), Miho Saegusa (violin), Ayane Kozasa (viola) and Karen Ouzounian (cello)-was recently awarded first prize at the 2017 Osaka International Chamber Music Competition in Japan, and are the 2017-18 MetLiveArts String Quartet-in-Residence at the Metropolitan Museum of Art. As part of their prize package, the Aizuri Quartet will receive performance and residency opportunities with prestigious presenters, including the University Musical Society (Ann Arbor) and National Sawdust (Brooklyn), as well as recording opportunities with Azica Records (Cleveland). Additional partners include Chamber Music America, Great Lakes Performing Artist Associates and the Interlochen Center for the Arts. New this year, the M-Prize winners will also be offered management by Concert Artists Guild, receiving the full scope of CAG’s management services as they join the CAG roster. CAG will also offer The Moanin’ Frogs and invoke automatic entries into the semifinals of their own competition, which will be held in October 2018. 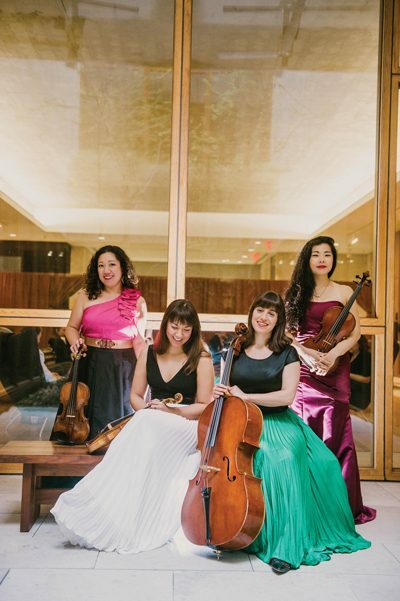 “The Aizuri Quartet was strong, dynamic, passionate and beautiful,” said Matt Albert, chair of the Department of Chamber Music at the U-M School of Music, Theatre & Dance and artistic director of M-Prize. “There are many ways to entertain through art, as all three of our first-place laureates showed, and Aizuri was particularly captivating in a way that resoundingly connected with our judges. It’s a privilege to be a part of a competition that enables these performances-which in turn illustrate exactly what we want the M-Prize to stand for. “The 2018 M-Prize competition featured 34 ensembles from across the United States as well as France, Austria, The Netherlands and the United Kingdom. The institutional representation of applicants was also vast, with ensembles trained at America’s most esteemed conservatories and performing arts schools, along with such venerable international institutions as the Conservatorium van Amsterdam and the Paris Conservatoire. The international jury representing expert academics and performers, chose the semifinalists in all categories and divisions. Jury members included pianist Joseph Kalichstein (Kalichstein-Laredo-Robinson Trio, The Juilliard School); cellist Yeesun Kim, (Borromeo String Quartet, New England Conservatory); saxophonist Claude Delangle (Conservatoire National Supérieur de Musique of Paris); bassoonist Andrea Merenzon (Orquesta Filarmónica de Buenos Aires); oboist Christian Schmitt (Staatliche Musikhochschule-Stuttgart); soprano Tony Arnold (International Contemporary Ensemble, Peabody Conservatory); countertenor David Daniels (U-M School of Music, Theatre & Dance); and Guggenheim Fellow and komungo performer/composer Jin Hi Kim (Wesleyan University), among others. M-Prize, supported by U-M’s Office of the Provost and an anonymous donor, was launched in 2016. The goals of the competition are to provide a world-class performance and adjudication platform for chamber arts; to launch and advance the careers of chamber ensembles through prizes, visibility and professional development opportunities; and to evolve the breadth and depth of the chamber arts landscape and associated professional opportunities for exceptional ensembles. Including the grand prize, more than $200K in prize money was distributed among the top three winners in three different categories-strings, woodwinds and open-in Junior (ages 18 and under) and Senior (ages 19-35) divisions. Past M-Prize winners include Russian Renaissance (2017) and the Calidore String Quartet (2016), who were recent recipients of a 2018 Avery Fisher Career Grant, one of the most prestigious awards in classical music. The open category can feature any instrumentation, including percussion, voice or technology, and music that contains a significant amount of improvisation such as jazz, bluegrass and world music.